I wanted to let you know about a great organization we've been involved with for many years. Plant With Purpose is a Christian nonprofit organization that reverses deforestation and poverty by transforming the lives of the rural poor. This year they have an Online Gift Catalog. Your donation helps them to meet vital needs in six countries where they change lives through economic empowerment, spiritual renewal, and environmental restoration to bring the land back to being a source of sustenance. 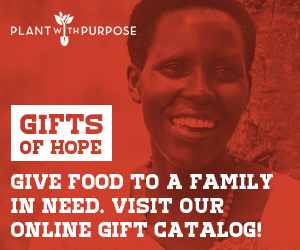 The Gifts of Hope (think: ecological toilets, family gardens, fuel-efficient cookstoves, sustainable agricultural training, discipleship and so much more) can be purchased through the site link above, and will deeply impact the lives of farming families around the world. Check it out! Wishing you joy as we celebrate our Lord coming to earth this holiday season.